My health is stabilizing at a not-quite-normal-but-still-vastly-improved state, so when Binod presented us with a choice of trails today—trek to Manang via the “normal” trail and get there within an easy 4 hours, or take a different trail that is steeper and longer, but far more picturesque—David and I both agreed on the longer trek. This choice wasn’t just because I’m feeling better, but also due to a much-welcomed break in the rainy weather that would enable us to see some amazing views. Much of the elevation gain for the longer trek is in what felt like one big, never-ending, heart-stopping hill. Once we reached the top, we had sublime views of Annapurna 2, 3, 4, and 5—almost perfectly lined up for their panoramic shot. From there, we continued on a trail that took us far from the main road and into a part of the countryside that is more remote and full of farmland with neat patches of land sectioned out for each crop. Farmers worked their land with ox-drawn plows, cows roamed aimlessly (as they tend to do all over Nepal), mountain goats grazed, and we finally saw our first yaks, which Binod says are aggressive animals and should be avoided. I think he made a point of telling me this because he’s noticed I have a habit of petting cows, horses, and oxen…all while David patiently waits nearby with a bottle of hand sanitizer. Hey look…there are B’s at this altitude! Manang is our acclimatization stop, which means we stay here for an extra day to acclimatize to the altitude. Speaking of which, though we’ve both noticed that we’re getting more headaches the higher we go, this is the first time I’ve noticed that the air is actually “thinner”—when I was falling asleep last night, I realized I was taking huge, gulping breaths to get more air. It’s a bit disconcerting, but I feel confident we’re handling the altitude well. David periodically takes our oxygen reading using his pulse oximeter and it’s definitely gone down, but not dangerously so. Today the weather has reverted back to its icky state (that’s a bonafide meteorological term) with overcast skies, periodic rain, and my all-time favorite: thick pools of shoe-sucking mud. Since the point of this day is to acclimatize, Binod and Lalman (our superman porter) took us on a short hike to gain some more altitude in accordance with the “climb high, sleep low” rule of mountaineering. 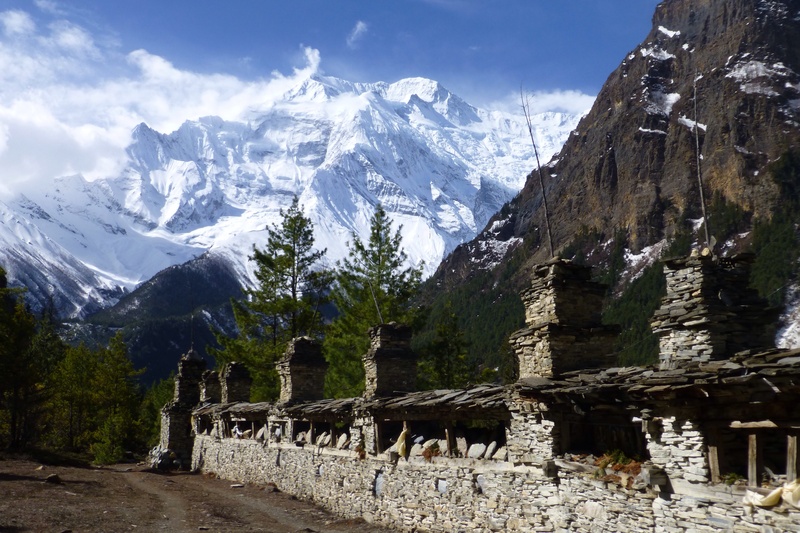 Since the normal destination was inaccessible due to snow, Binod planned an alternate hike that would take us to the top of a smallish, snow-covered hill nearby. While I’m typically stoked to go up any snowy hill, it’s because I have skis attached to my feet and the promise of fun on the way down. The idea of going up the hill without the skis wasn’t really inviting. Nevertheless, David talked me into it and the minute we hit the snow I immediately started post-holing like crazy, which everyone knows is just plain miserable (and occasionally dangerous if you tweak your leg joints on the way in or out). With all the slipping and post-holing, the climb was very slow, but we eventually made it to the top. As usual, I was glad we did it once we got there. Later in the day, David and I attended a discussion about Acute Mountain Sickness (AMS) at the local aid station, where David happily listened and chatted with the volunteer doctors about the latest Diamox protocols and whoosy whatsits. I left after 45 minutes to plant myself at a coffee shop and have a croissant. I think this paragraph perfectly summarizes our personalities. I should note that not all stops are in villages that have such things as aid stations and cafes with coffee and croissants, lest anyone get the very wrong idea that this is a luxury trek. Manang is unusual in that it was the first stop we encountered these things—probably because it’s an acclimatization stop, which means trekkers will be there for more than one night. Yak Kharka is much more typical: a tiny little village with only a few unheated guesthouses and maybe one or two places to buy necessities such as toilet tissue. Our guesthouse is a bit more modest in that it doesn’t offer a shower, which means we either revert to the wet-wipe camping method or purchase a bucket of hot water. We did the latter. While it’s absolutely frigid outside and the idea of doing a sponge bath in an unheated squat-toilet stall is appalling, the idea of not washing at all is just too miserable to contemplate. Meanwhile, we’ve had some great news: the pass is open again…for now. We saw a lot of helicopter activity yesterday for mountain rescues (likely due to AMS) and one person descending via horse for the same reason. Altitude is nothing to play around with. So far, we’re holding steady in the acclimatization department, although I’ve managed to develop a nasty chest cold because why not…par for the course. All I can do is hope it won’t interfere with my acclimatization as we get higher. As for today’s trek, it was shorter because each day we can only ascend 500 m (1640 ft) to ensure we give our bodies time to adjust to the new altitude. (In fact, each day of this trek is planned so that that the final destination of the day is 500m +/- from the previous location, even if the overall elevation gain for the day is actually far more due to multiple ascents and descents). The trek today was truly lovely and we got our first look at Thorung Peak in the distance, where the infamous Thorung La pass is located. We also saw herds of mountain goats, yaks, and numerous other mountain wildlife. We’re above treeline now, so we’ve traded the beautiful forests for barren rock with bits of snow and smatterings of green grass. While this doesn’t sound particularly picturesque, it’s actually equally breathtaking because we’re just that much closer to the magnificent snow-covered peaks that have beckoned to us from the moment we started. Each morning, as I stand outside ready to tackle a new day of trekking, I take in a lungful of thin mountain air and think to myself that the sight of these mountains just never gets old. Today’s trek was similar to yesterday’s in time and distance, but included a risky landslide crossing that required us to leave earlier to ensure we crossed it before the afternoon winds began to make any loose bits of rock airborne. We did see falling rocks anyway, but they fell because of a passing herd of mountain goats high above us; thankfully, we saw the goats dislodge the rocks, so we were prepared and simply waited for them to pass. 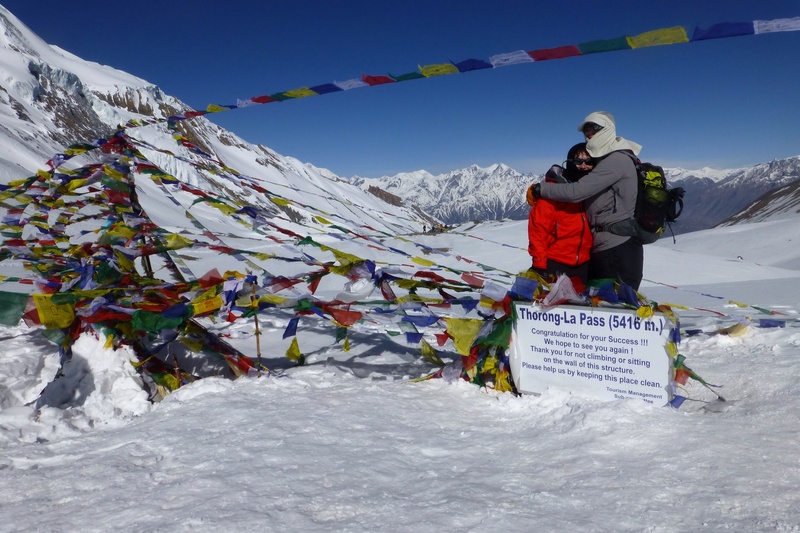 Now we are in Thorung Phedi, which is considered the “base camp” of Thorung La pass. It’s our last stop before we make a push for the high pass tomorrow. As of Yak Kharka, we’ve officially reached an altitude where the elevation is too high to expect running water in the outdoor squat toilets or even a cold shower, so we have to make due with wet wipes and water from the guesthouse kitchen, which we then treat to make it drinkable. At this altitude, taking care of basic necessities is practically a full-time job. The day we’ve been waiting for has finally arrived—the day we go over Thorung La pass, which is one of the highest mountain passes in the world. Our alarm goes off at 3:00 am. It’s a long uphill push to the pass, so we have to get an early start. We bundle ourselves up with several layers of clothing, get our packs ready, don our headlamps, and then wolf down a breakfast of eggs and cold chapatis. Outside the temperature feels impossibly cold, but I forget about that for a second when I see the clear night sky awash with billions of stars. At this altitude, with no lights to obscure their brilliance, the stars are like diamonds sewn into a blanket of black velvet. At 4:00 am we begin our ascent. We trudge forward in a march that is necessarily slow because of the altitude; however, I’m not sure I could go faster even if I wanted to (while David never seems to have problems with climbs). The ascent is surprisingly sketchy in some parts, mostly where loose rock has been exposed under the melting spring snow. In one spot, a landslide has washed away the trail and all that remains is enough for a single foot placed in front of the other with the mountain on the left and a drop on the right. Thankfully, this part is short. The sun has already risen and dusted the peaks with a soft pink hue that gradually turns to a soft amber as the sun moves higher in the sky. I find that I don’t really think full thoughts while I trek (I just focus on moving forward), but I do have a moment where I think of how unlikely it feels that David and I are even here. 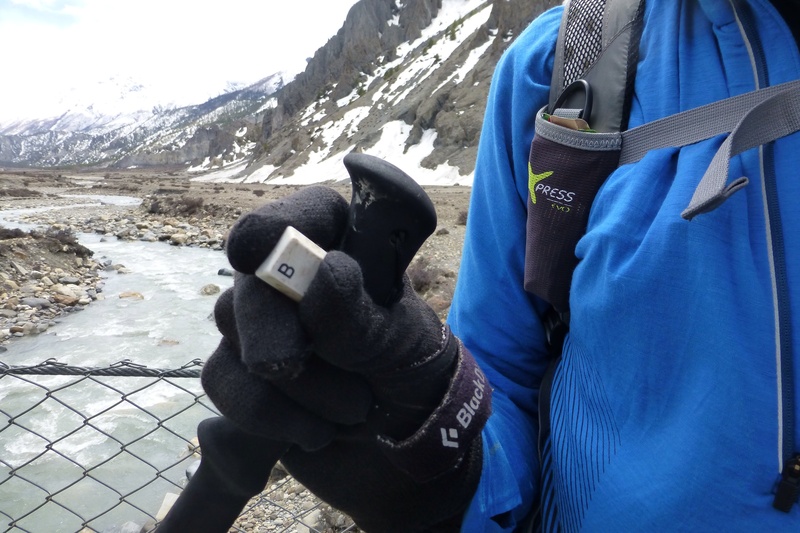 First, there was the possibility of the trek being canceled due to bad weather. Then I got really sick. Then the pass closed due to more inclement weather. During this entire experience, I reserved a big space in my head and heart for the possibility that this day would not come…yet here we are. The weather that had been so poor just a few days earlier could not be more perfect—the sun is shining brightly, the sky is a clear and brilliant shade of azure, and it is all juxtaposed against snow so white and reflective that I can only comfortably look at it through sunglasses. After several hours of steady uphill climbing and a few false “summits,” we begin to hear cheers up ahead. We finally made it. 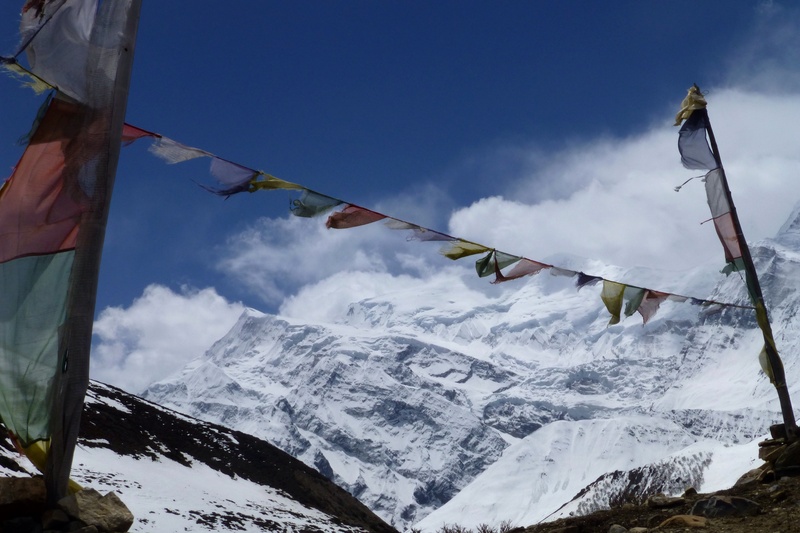 As we approach the highest point of Thorung La pass, I note how little fanfare there is to the site itself—it’s marked only with colorful prayer flags, a little sign, and a small tea shop so trekkers can celebrate their accomplishment with a steaming cup of masala tea. Perhaps the site doesn’t need fanfare because trekkers all around us are creating their own: a young British man pulls out a cigarette and passes around a bottle of gin, groups of trekkers cheer and celebrate, and a Spanish man with a long gray beard and John Lennon glasses breaks out in a lively song and dance. And what did we do? Our little group simply passed around hugs and high-fives, took a few pictures, and then quickly went on our way. That might sound anti-climactic, but it’s really damn cold at 17,764 ft and we still had a long trek ahead of us to Muktinath, all of which is steeply downhill (which is just as challenging as the uphill, I might add). After an extraordinarily long day, we finally arrived in Muktinath completely, utterly exhausted. David and I luxuriated in our first hot shower in a few days, did some wash, and had a good laugh over our bathroom sink, which lacks a pipe and spills water all over the floor. All of this—the trek, the mountains, and even the sink—can be yours only in Nepal. Today is supposed to be our last trekking day. However, last night Binod suggested that we take a jeep to Jomsom instead. 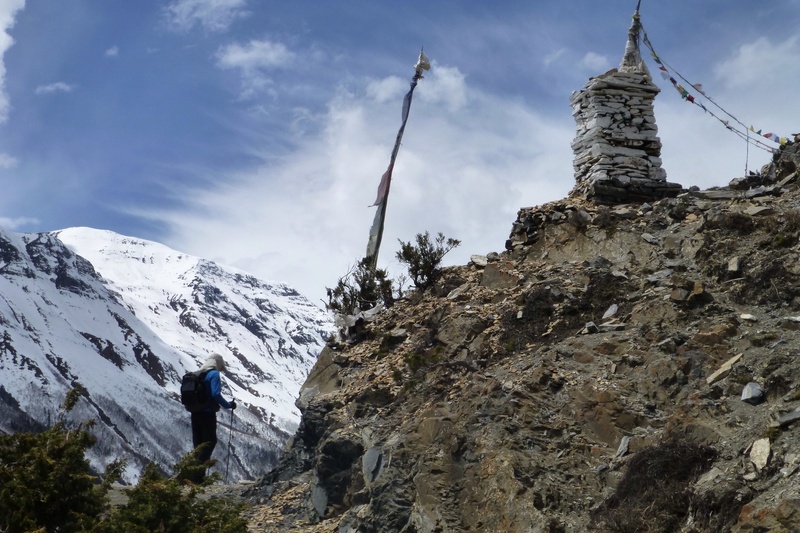 He explained what we could expect for the day’s trek—the higher winds on the Muktinath side and the reappearance of that ol’ dusty road—and explained that many trekkers opt to take a bus or jeep on the Jomsom day. Despite my exhaustion, I inwardly rejected the idea outright (thinking “no way! It’s our last day of trekking!”), but I told him I would let David decide. To my utter surprise, David chose the jeep. The jeep! I think the idea of trekking along a dusty road with a face mask just didn’t appeal to him. So, here we are in the town of Jomsom after yet another squished and bumpy ride on the jeep. I confess that as we were walking toward the buses and jeeps this morning, I noted how the dust of being back in “civilization” made it difficult for me to breathe with my chest cold, so perhaps jeeping on our last day of trekking wasn’t such a bad idea after all. Illness notwithstanding, it’s been a sublime experience. We trekked over 60 miles, nearly half of which was above 10,000 feet. We started our trek at 4723 feet and reached a high point of 17,764 feet with multiple ascents and descents in between, resulting in many thousands of feet of elevation gain. My health improved and I was able to appreciate this experience in all of its glory. I can find no words to describe what it’s like to breathe this mountain air, to be surrounded by so many majestic peaks, and to simply be in this sacred space in the world. It’s something you have to experience for yourself…and then be prepared for wanting to return. The mountains are already calling us back.